The following interview was conducted between Roleplayers Chronicle Editor-in-Chief Aaron T. Huss, denoted by the prefix RPC, and line developer Jason Hardy of Catalyst Game Labs, denoted by the prefix JH. The interview was conducted via Skype messenger. RPC: Welcome everyone to another edition of A Word in Edgewise. Our latest interview is with Jason Hardy of Catalyst Game Labs and Shadowrun fame. Jason, can you start by introducing yourself, telling us what you do for Catalyst Game Labs, and a bit about your history within the tabletop RPG industry? JH: Sure. I’m currently the Shadowrun line developer for Catalyst, which means I oversee the Shadowrun role-playing products we release, from conception to print. I’ve been in that position for about four years now. RPC: What other credits do you have in this industry? JH: Before my current position, I did freelance writing and editing for both BattleTech and Shadowrun. I’ve written two BattleTech novels, co-written a third, and I also wrote a Shadowrun novel. I did some miscellaneous writing during the d20 heyday for a number of companies as well. My first gaming-related assignment was a Crimson Skies novel. Which, sadly, never came out in English. RPC: How did you land into the line developer position for Shadowrun? JH: I’d been doing some different freelance work for Catalyst and Shadowrun, and four years ago at GenCon I heard they were looking for a new line developer. I approached the president of Catalyst, asked for an interview, and was hired before GenCon ended. RPC: That’s quite a position to command, especially with the upcoming 5th Edition. What was main driving force behind producing this new edition? JH: The main thing was that we’s had Fourth Edition out long enough that we knew what we liked about it and what we might want to change. We didn’t feel it needed a complete rebuild, but we thought this would be a good time to make some improvements, change some things that didn’t work as well as we might like, while building around a strong core of rules. RPC: Has this been known for the past four years or was the decision to produce a 5th edition made during the past year? JH: I didn’t have a plan in place for Fifth Edition four years ago—in fact, I generally threatened to punch anyone who said the words “Fifth Edition” to me until I got a better understanding of what it meant to be line developer. But we knew this time would come, and in the second half of 2011 we started thinking and planning the new edition. Then we drafted a rules committed to start building the structure, and we were off and running! RPC: If we can take a bit to delve into 5th Edition more, I’d like to start with an understanding of what the biggest changes are. JH: Sure. One of the things I wanted Fifth Edition to accomplish was to make the character the source of awesome. In other words, when you accomplish things, you may have gear help you, but it’s your skills and attributes coming to the fore to make you a legend. To accomplish that. We wanted to change gear a little but so that it offered good bonuses but not always stacks upon stacks of dice. We added a mechanic called “limits,” which acts as a cap on the number of hits you can count in a given dice roll. Gear plays more of a role in affecting limits, less of a role in increasing dice pools. If you want a big dice pool, you’re going to get it through skills and attributes. To that end, we also raid skill caps from 6 to 12. Matrix rules and mechanics have been significantly revised to bring them more in line with the mechanics in the other areas of the game, make them easier to use, and get hackers more involved in the flow of the action. We changed vehicle chase rules because Fourth Edition rules were sometimes problematic. We also did a lot to rebalance magic through drain values and gear through the bonuses it provides and it’s cost. Those are some of the larger areas. RPC: Does this equate to a reduction in a piece of equipment’s lethality or does it rather move its benefits from damage to some type of efficiency whereas it plays off a character’s skills more? JH: Actually, in some ways gear is more lethal. Another change I wanted is for combat to be a little more deadly, though without player characters dropping dead too easily. So while gear will not always make it easier for you to hit your target—you need your skills for that—it will generally pack more of a punch when it does. RPC: Do you balance that with an increase to a character’s health? JH: No, but we increase armor values, provide some extra healing options, and make characters slower to die once they’re unconscious. RPC: Ah, now I see the balancing trick. Are there any setting changes involved in this new edition? JH: Not huge ones. We didn’t do a time jump or anything—things flow pretty smoothly from Storm Front, the last Fourth Edition plot book. The nature of the Matrix has changed, but we’ve been planting seeds of that change for more than a year now. RPC: I’ve seen other game systems and settings do drastic changes to the look of their settings through artwork changes from one edition to another. 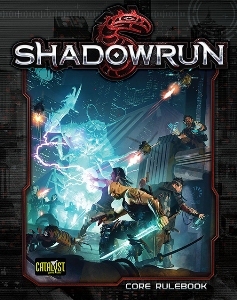 Knowing that the artwork is new, does it still reflect the same look and feel of Shadowrun throughout the past 5 years? JH: Yeah, essentially. We still use sign posts like Blade Runner and the high-contrast look of film noir. Shadowrun has a great look, and we don’t need to re-invent it. We just want to keep pushing it to look cool! RPC: Let’s move away from just 5th Edition and talk about the ins and outs of Shadowrun itself. Can you take a quick minute and explain the basic dice pool mechanics used in Shadowrun? JH: Sure. Whenever you’re trying to accomplish anything besides a simple task, you have to make a test. There is a skill related to the test (like the Pistols skill for firing a pistol) and an attribute tied to it (in the case of Pistols, it’s Agility). You add your rating in Pistols and your rating in Agility together, then you have a number. You roll that number of six-sided dice and count up the 5s and 6s you rolled. Those are your hits. You can apply the hits you got, up to the limit on the test (which in this case would be imposed by the pistol) to see if you have a chance at shooting the opposition. The opposition will make a test of their own; if they get more hits than you, you missed; if you got more hits, you hit! RPC: And now can you take a quick minute to explain the basic setting of Shadowrun? JH: Absolutely! Shadowrun is set in 2075. Magic returned to the world in 2011, brining with it elves, dwarfs, trolls, orks, dragons, and all sorts of fun. Governments have faded in strength, being eclipsed by megacorporations. It’s a dystopian future, where you survive either by selling your soul to the corps or looking to forge your own existence, doing the kinds of jobs no one else wants to do. These are quasi-legal or downright illegal activities, so they’re designed to take place in the shadows of this world. If you’re the person doing these jobs, you’re a shadowrunner. You’ll face cybered-up street punks, psychotic wizards, hardened Mafiosi, and domineering corporate profiteers all in your effort to survive and maybe, if you’re lucky, thrive. RPC: Considering only these two absolute basic principals of Shadowrun, how does Catalyst Game Labs plan to market 5th Edition to draw in new customers? Are you going to focus more on the uniqueness of the setting, the power behind the dice mechanics, a little of both, or present something fresh such as a starter box? JH: We’re going to focus on the character experience of building a shadowrunner who can be more awesome than ever, but we are also going to focus on the range of new ways to get involved in the Shadowrun setting. In the next year or so there will be an intro box set, a deck-building game, a board game, a miniatures game, and two computer games. You can play Shadowrun however you like, and if you have fun, you can dive into one of the other games. Keep playing Shadowrun all you want, and keep having fun! RPC: So the focus is on taking the Shadowrun setting and making it more than just an RPG; it’s going to become a setting for all to get involved in…? JH: Yep. Whatever flavor of game you like, you can play in the Shadowrun setting, and if you want to go deeper, we’ll be ready and waiting for you! RPC: By deeper, are you referring to the RPG? Such as grasping the entire concept of Shadowrun going from an intro box or other game product to the core RPG, possibly the continuing driving force behind the setting? JH: Yeah, I think the RPG gives you the deepest experience, letting get into the full breadth of the setting. I’m excited about all the games, but by their nature they tend to have certain built-in limits. The RPG is where you can really set yourself free and get involved in whatever story grabs you. RPC: Are you planning to maintain your current publication model going into 5th edition? Or are you planning to “rethink” how and what types of products you release in their various formats (PDF and Print)? JH: We’re always experimenting. The PDF line is exploring ways to have more books that work in concert with each other, which is exciting. We’re also looking at new ways of presenting info in the print books—for example, I want to have books that focus on certain types of runs, such as extractions, that provide plot hooks, tactics, gear, and other information related to doing that kind of work. RPC: That sounds like an all-encompassing piece for quick game-play. Have you ever considered allowing third party publishers to create Shadowrun supplements under a licensing agreement? JH: That’s a tough one, and one that we don’t have full control over since Topps is the ultimate license holder. However, we’ve been able to forge some cool relationships, like with Lone Wolf Development who made the awesome Hero Labs for Shadowrun, and I try to at least listen to proposals that come my way and see what I can do. RPC: Catalyst Game Labs recently announced a limited edition release for Origins. Is this a complete core rulebook, like a preview of the upcoming core rulebook? Or is this some type of Quick Start package? JH: It’s pretty much the complete rulebook. The only thing it’s missing are some fold-out images of some cityscapes and other art that we have in the core book. Getting those fold-outs in wasn’t possible with the Origins time frame, and we wanted the good folks at the con to be able to get a book in their hands, so we made this happen. It will have the full text of the book in it, down to the last table and index. RPC: To confirm, the 5th Edition core rulebook is expected to be available at Gen Con, correct? JH: Yes. There are always things that can go wrong, but if production proceeds as we expect, it should be there. RPC: Excellent! Jason, that’s all I have. Do you have anything you’d like to add? JH: Just that I’m really excited to see all this stuff come out, and for people to see if they can design characters that will pay the price to be awesome shadowrunners! Thanks for the interview! I’d like to thank Jason Hardy for taking some time to speak with us about Shadowrun and the upcoming 5th edition core rulebook.